Thin pancakes are common in many cultures around the world. Ancient Ukrainians used them in religious ceremonies. Other areas in the Middle East and Russia also made blins, thin pancakes. Blintzes were popularized in the United States by Jewish immigrants. Although cheese-stuffed and oil fried blintzes (now usually made with French-style crepe) are not part of a religious ritual, they are customarily served during holidays. These blintzes are cheese-filled with a fruit and sour cream garnish. However the filling can be what ever the maker wants - fruits, cheeses, meats, vegetables, and even caviar are used in a variety of blintzes, some resembling Southwestern-style burritos or even Chinese-style egg rolls. To make the filling: Set cream cheese out before hand to warm to room temperature. In mixer or food processor, beat cream cheese until smooth. Slowly add sugar until incorporated and creamy. Continue beating and slowly add the egg, cottage cheese and the vanilla. Beat until well mixed. Cover the mixture with plastic food wrap and refrigerate for about a half hour to firm up the mixture. You will have to portion out your filling. The recipe makes enough filling to put about ¼ cup of filling in each crepe. Lay crepe on a dry surface with the second side up. Place a scant ¼ cup of filling a little off center, closest to you. Pull bottom flap up and over filling. Bring right and left flaps towards the center, gently centering the filling. Roll the crepe until the top flap is taken up. To fry the blintzes: Melt a dollop of butter in a medium hot non-stick frying pan. Lay the filled crepe, seam side down, an fry until golden brown, 1 to 2 minutes. Gently turn over and fry the second side until golden brown. Place on a rack to cool. It is best to make the blintzes as you fry them. If you roll too many blintzes ahead of time, the crepe absorbs moisture from the filling and tear easily. 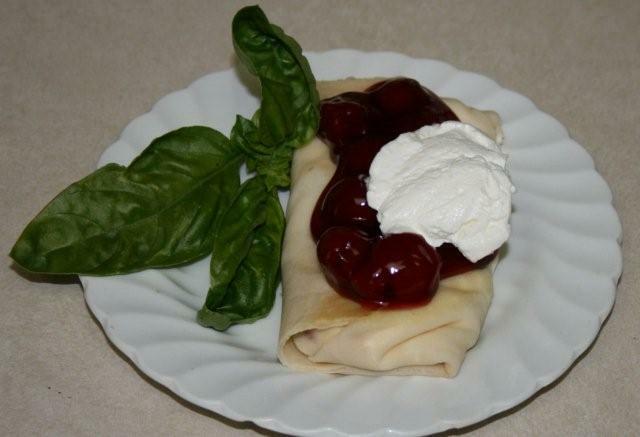 To serve, add a spoonful of the cherry pie filling over the top of the blintz and garnish with a dollop of sour cream. A splendidly elegant dessert.